As you may already be aware, I am a bit of a Fiddle Leaf Fig fanatic. They are a much loved houseplant that can be a little tricky to care for. This is only made worse by the misinformation on the internet! However once you understand what the FLF’s natural environment is like, it’s so much easier to grow a healthy, thriving Fig. So in light of some of the errors I’ve heard recently, I thought I’d dispel a few myths about Fiddle Leaf Fig care to get you growing them like a pro! The common information about FLFs needing bright indirect light isn’t exactly true. Fiddle Leaf Figs will take all the light you can give them! They are full sunlight plants in nature and can handle a full 6-8 hours of direct sun a day – ONCE they have been hardened off. If you’ve noticed a bad result from direct sunlight it may be because your FLF is not used to it. Without gradually acclimatising them to direct light, they can get sunburnt leaves and dry out too much. But once a FLF is used to direct light, it will grow like crazy! Take the time to start your FLF on an hour-ish of direct morning light each day, working up to putting it in full sun. What does this mean for your indoor Figgy without direct sun? A FLF can still be placed in bright indirect light, however it probably won’t reach its growth potential. A lack of sunlight can cause leaf drop or slow down growth. If you want to keep your FLF in a spot without direct light, you may want to supplement its growth with a grow light. This post can give you more info on the best grow lights for your situation. One: FLFs like well-draining soil and pots that are slightly smaller. A well-draining soil will dry quicker, while other soils may stay damp and eventually cause root rot. If you repot in a well-draining soil, you may notice you need to water more often as the soil dries quicker. Two: How often you water also depends on how fast the soil dries due to the temperature, humidity and season. Your watering will most likely slow down during winter as the soil takes longer to dry in cooler air. However, if your FLF is indoors, a less humid environment can also cause it to dry out. FLFs like humidity levels 60% and over. Any lower than this and growth will slow down, while leaves may potentially dry out and turn brown. To help raise humidity indoors, some people like to use a humidifier. Humidity can also allow you to water less, as the plant will get some moisture through the air. Three: The FLF is a plant that likes to mostly dry out between waterings. They do best with larger amounts of water less frequently, as opposed to watering in small sips. Watering in small sips is dangerous as not all the roots may receive the water they need using this method. Watering until the roots are saturated allows for healthier roots and growth. If this all sounds a bit complicated, don’t worry! You will begin to know how often they need watering in your environment over time. A reliable moisture meter can help in the early days to help you understand how quickly your FLF’s soil dries. We’ve just learnt that there’s a few factors that impact on watering your FLF. Another one is that when the top inch of soil is dry, it’s time to water. The problem with this is that FLFs like to mostly dry out before receiving a watering. Just checking the top inch isn’t enough – the rest of the pot may still be moist and this can lead overwatering! Overwatering can lead to leaves dropping, root rot and bugs. A better method is to use your finger or a dowel to check the moisture a few inches down into the pot. Or, get a reliable moisture meter to check. That way you’ll always be sure your FLF is ready to be watered! When you do water, be sure to water until the excess drips out the bottom of the pot. Staking a weak or leaning trunk can be beneficial, but its not ideal. Really you’d like your FLF to stand strong on its own, right?! Staking can be helpful for temporary but immediate support if your FLF trunk is really bending. Instead of staking, there’s other things that can be done to get the FLF trunk to thicken and grow straight. One: Wiggling the trunk. Yes, it sounds ridiculous. But in nature, the wind bends and sways the trunk naturally. In response to this, the plant grows the trunk thicker and stronger to withstand the wind. If your FLF is indoors, spend a couple of minutes 2-3 times a week wiggling the trunk. Start around mid height with small swaying, until you work up to quite a bend. Your FLF can withstand more than your think without breaking! It needs this bending to force it to strengthen. Within a few weeks you should notice a difference! Two: A trunk can also be thin due to a lack of leaves. This is because leaves provide the trunk with nutrients to grow. Without leaves that grow closely together, the trunk won’t be getting as much support as it needs. A thin, leggy-looking FLF (like the one above) is often due to a lack of sunlight – the FLF grows straggly in search of light. So firstly, put your FLF in a brighter location. Secondly, pruning the tip can encourage more leaves and branches further down the trunk, which will also help support your FLF. Read a step-by-step guide to strengthening a leaning FLF trunk here. Lastly, a quality fertilizer can help the trunk grow strong. I really noticed a difference in the trunk of my Fig tree after using fertilizer for a while. It really thickened and stopped bending in wind when I took it outside. If you haven’t tried a quality fertilizer on your Fig yet, this is a great fertilizer specially formulated with the correct ratio of nutrients FLFs need. For more info on fertilizing your FLF, see this post. It’s true that Fiddle Leaf Figs are tropical plants and love a humid environment. However what you may not know is how little misting helps to increase humidity. In fact, it can even be HARMFUL to your Figgy! Using a spray bottle to mist a FLF is marginally effective, as the mist only lasts a few minutes before drying. What it does do, is cause cells in the plant’s leaves to close up, like how the plant would naturally respond to rain. These stay closed for a lot longer than the misting lasts. When they are closed, the plant cannot photosynthesise! So while you may be thinking you’re increasing your plant’s air humidity by misting several times a day, the plant is unable to process sunlight for much longer, making misting do more harm than good. It can also attract pests and disease – something no one wants! The only time misting is beneficial is to use a spray bottle on any new leaves forming at the top of the plant around twice daily. This will allow the leaves to grow without sticking together due to dryness (the reason some new leaves get holes). A better way to increase overall humidity levels is by getting a humidifier. Make sure it is not spraying directly onto the plant’s leaves, but keep it nearby to increase humidity in the room. We all love shiny, glossy leaves. But using coconut oil, milk or other substances to get that shine is only doing harm! Any substance you put on the plant’s leaves potentially blocks the leaves not only from breathing, but also from photosynthesis. Instead, use a damp or dry cloth, or give it a hose-down every now and then to keep any buildup off the leaves. Dust can also block the leaves! If your FLF get some direct sun, in warmer temperatures any oil that sits on the leaves can cause the leaves to burn. I have experienced this and its not nice! Burn and sunburn can start anywhere on the leaf and turns yellowy before going crispy brown. So there you have the six myths about Fiddle Leaf Fig Care! 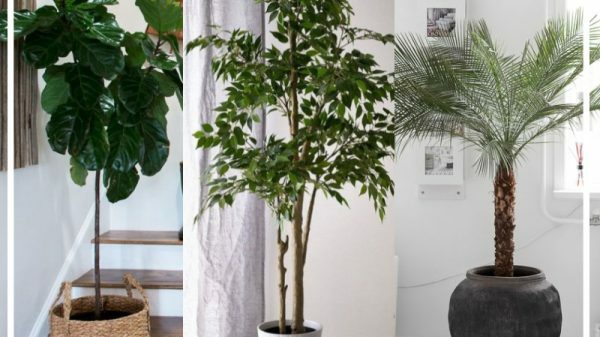 I often read some these myths on the internet and to be honest, I believed some of them when i first got a FLF too! While I’m sure everyone is trying their best to be helpful by sharing what they know, I know how frustrating it can be to feel like something isn’t working for you. I hope this post has helped clear up a few things and you understand more about a Fiddle Leaf Fig’s natural environment. 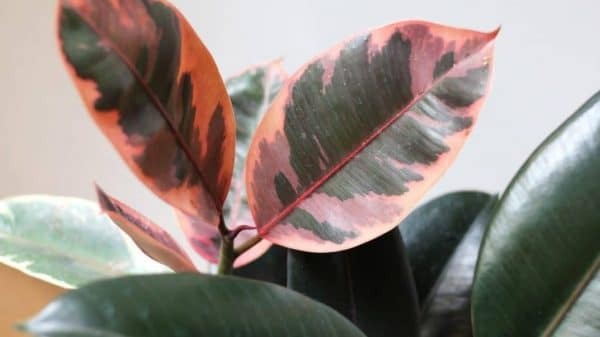 It has helped for me to remember that they are tropical plants, and to do my best giving them a tropical environment to live in – light, water, air flow and nutrients have been game changers for mine. Let me know if you have any questions or check out my page dedicated to Fiddle Leaf Figs for more info. Thank you for this information. I’m going to replant mine in well draining soil because it’s leaves are turning brown. How often should I have the humidifier running please? Hey Christy, well draining soil is definitely best for FLFs! The leaves can turn brown for a few different reasons. When the soil is holding too much water, it can cause really dark brown spots that start in the middle of the leaf. Brown spots can also be caused by dryness and these usually begin on the leaf edges and are a lighter brown. Whenever I look at the plant it seems like a daunting task. I hope I can master growing a beautiful lush plant! Don’t be daunted Helaine! Once you get the basics right, they are actually easy to care for and not as finicky as people say 🙂 I’m sure you will master it it no time. All the best! How can I get my Fiddle leaf to branch out. It is growing vertically but does it does not branch out.